An hour into my drive home I watched the red-orange landscape around Gypsum, Colorado, transition into the craggy grey of Vail Valley. 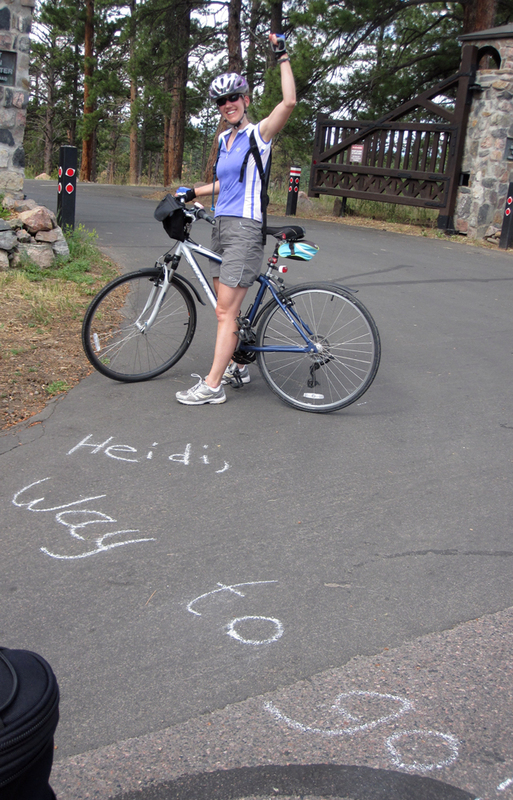 My mind shifted from busy camp schedules and activities to inward contemplation. I had just spent the last eight days volunteering as a cabin counselor at the Crohn’s and Colitis Foundation of America’s Camp Oasis, and I had much to process. The hours of uninterrupted thinking time that now lay before me was exactly what I was craving. I turned up the tunes and let my mind go back to all the moments of camp. My camp experience began with a full day of orientation before the kids arrived. We learned the policies of the camp, information about all the activities and the schedule, and how to help campers with common issues such as homesickness. I had been a little nervous at home, but felt much more prepared after these sessions. I also had a chance to get to know all the other volunteers who were helping out in a variety of roles ranging from cabin counselors to medical staff to kitchen help. One unexpected thing for me at camp was that I seemed to be the only volunteer cabin counselor who had IBD (as far as I could tell through conversations anyway). Many of my friends who help out at Camp Oasis at some of the locations out east have talked about shared IBD experiences among the counselors. The camp in Colorado is only two years old. I would imagine that in years ahead as campers get to be the age where they can volunteer as counselors, there will be more cabin volunteers who have lived with Crohn’s and Ulcerative Colitis. 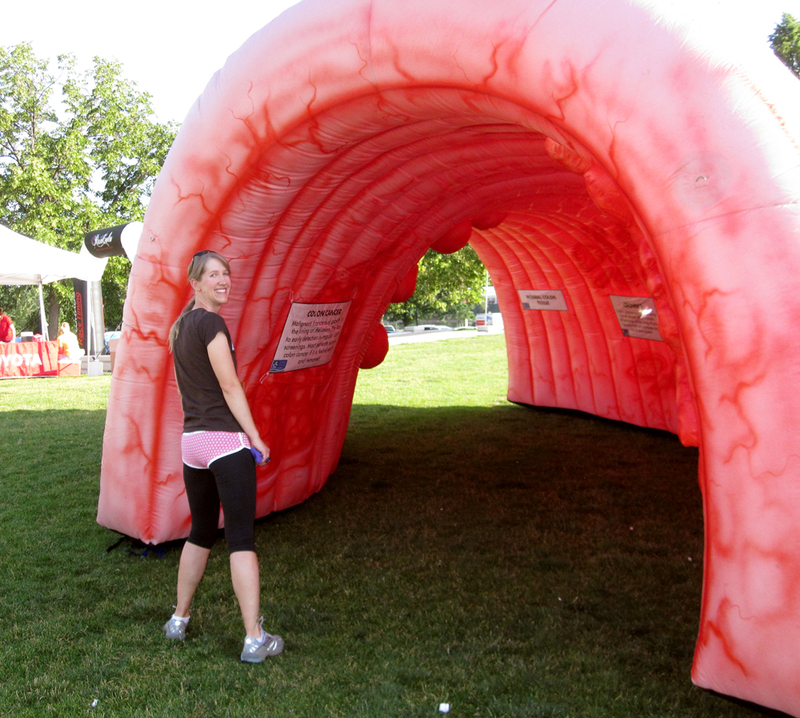 Whether or not they had IBD, all the volunteers I worked with were absolutely amazing. They gave their time because they wanted to help chronically ill children have the time of their lives at camp, and they did so with enthusiasm and devotion. Roundup River Ranch, the camp at which the Colorado Camp Oasis is hosted, is a beautiful facility with some of the most energetic, capable and dedicated staff I have had the pleasure of working with. The medical personnel were incredibly caring and the kitchen staff worked tirelessly delicious meals that were enjoyed by all the campers, even those with food intolerances and allergies. The staff camp counselors put vast amounts of time, passion and energy into making sure the kids had the best experience possible. The cookhouse, cabins and medical facility were top-notch. The beds even had Tempur-Pedic mattresses which had been donated. 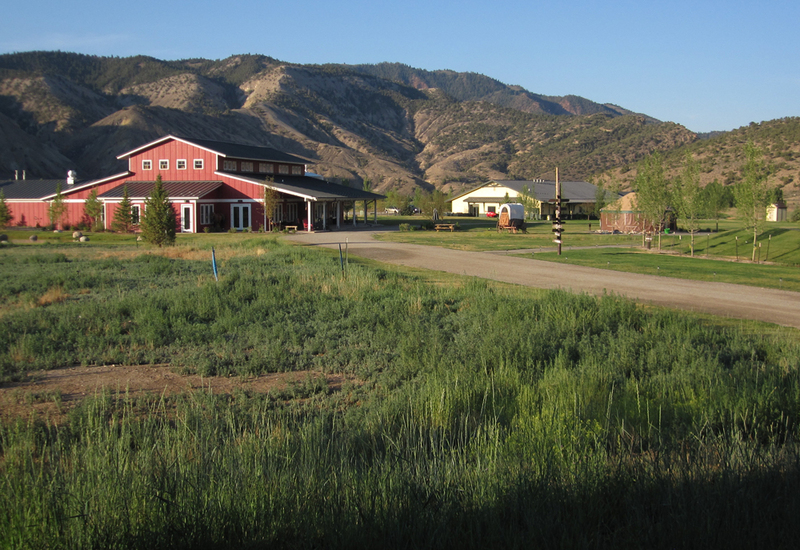 A view of Roundup River Ranch including the cookhouse and medical building. I even had a chance to experience the excellent medical facility, called the Depot, at camp myself. On the second day, I came down with a low-grade fever, horrible sore throat and cough. The doctors and nurses felt I just had a cold virus of some sort, but put me up in a private room set aside for ill staff for 24 hours. I was incredibly bummed to miss a day with the campers, but knew I needed the rest. I was reunited with my group and, though still not back to 100%, felt much more energetic for the rest of the week. I also went over to the medical facility to change my ostomy appliance. I was a little concerned about monopolizing the bathroom in my cabin quarters, so I talked to the nurses and they recommend I come over to the Depot to change. This was nice, since I am not the fastest at my appliance swaps. The skin around my stoma is in beautiful condition, but achieving this takes some time for me. Per recommendations from my WOCN and the home health nurse I worked with after surgery, I have a meticulous routine that includes a small piece of Duoderm, an Eakin Cohesive Seal, and even a little stoma paste. I can sometimes spend 30 minutes changing out appliances with these steps, especially if my stoma starts spewing. I greatly appreciated having a private place to carry out my skin care routine at camp. I was a counselor in a cabin of eight 12- and 13-year-old boys. The camp had ended up with a shortage of male staff and volunteers, so each of the boys’ cabins had two female counselors and four male counselors. Most of the camp counselor staff at this camp are paid and there for the whole summer, and volunteers augment the paid staff. Of the six counselors in my cabin, two of us were volunteers. This was nice because there was much expertise, and I never felt like I was left to handle a situation that I wasn’t prepared for. There was always a regular staff person close by to help out. 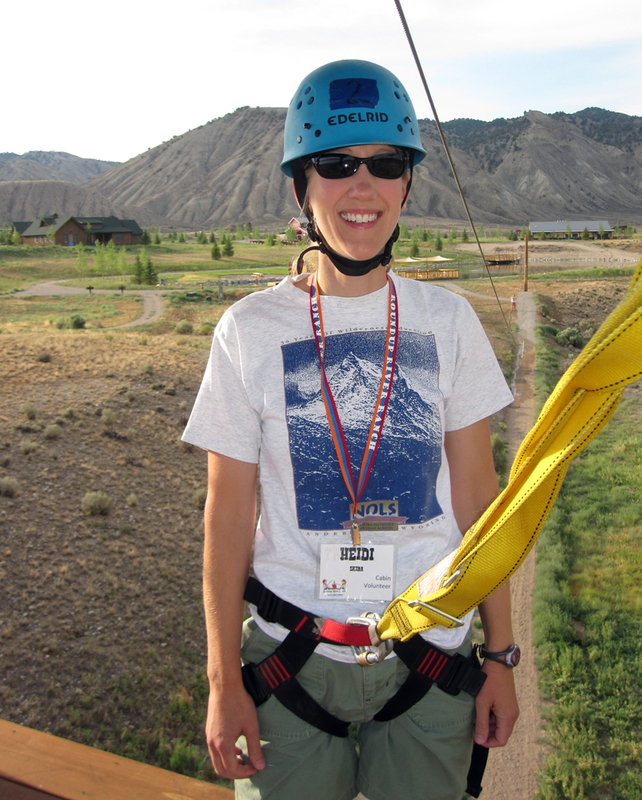 I got up bright and early one morning to try out the zip-line during a special session set aside for volunteers. It was high! 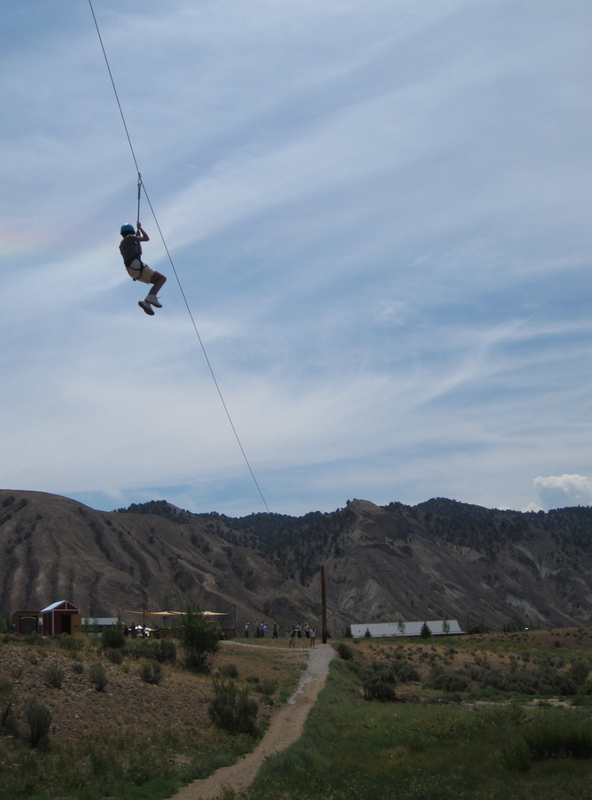 As I stepped off, I was reminded of how the campers were willing to try so many new and challenging activities. The boys in the cabin were such a great group of kids. Though I struggled a bit with conversation at times (not knowing much about sports teams and being inept at quoting movies–both popular with this age group), I loved working with the kids and cheering them on at all their activities and playing silly cabin games like Mafia and Ninja. Days were filled with all sorts of fun activities like archery, arts and crafts, climbing and zip-lining, horseback riding, boating and fishing. A highlight of the week for me was the talent show. The kids came up with magnificent acts, and I was blown away with how much the children encouraged and cheered each other on while they were watching the performances. It was absolutely beautiful. One of my favorite parts of camp was quietly listening to the children share stories with each other. One day I heard three boys at lunch encouraging a camper who worried that he might not be able to have a career in the military because he had Crohn’s. The other boys were telling him he would be able to do anything he set his mind to. I also heard the children talking to each other about surgeries and medications, belly noises and going to the bathroom a lot. Another counselor in my cabin saw some of the kids showing each other their surgery scars. This is the magic of Camp Oasis; the children are given the opportunity to take part in a fun camp experience while building friendships and bonding with others who truly understand what it is like to have the same chronic illness. Every night right before bed, each cabin took part in an activity called cabin chat which provided a time to talk and reflect as a small group. The cabin counselors posed several thought-provoking questions for the campers to answer in a quiet and safe atmosphere. These questions were never directly related to illness, but many of the campers answered with things that tied into having Crohn’s or Colitis. Counselors also had the opportunity to answer the questions. During one cabin chat a few days into the session, a question fit well with my experience of having UC, so I shared that I had the disease. I really have no way of knowing if it made a difference to the children. However, I had many conversations about camping, climbing, skiing and canoeing with the youngsters (which were popular topics with several of the boys). Perhaps in some small way the children realized that having ulcerative colitis has not stopped me from leading a full life. On the final evening of camp, the children made a “web of gratitude” where they came up and told everyone the things that they were thankful for by adding a strand of yarn to a circular frame. Listening to the things that the children shared brought tears to my eyes. It was clear how much this camp experience had meant to them, and I was so happy that I had been part of it. My three-hour drive home was not nearly enough time to process all the things I had learned at camp… all the inspiration I was feeling… and the amazing memories that will be part of me forever. When I got home I talked to Doug about it for so long that I nearly lost my voice. I don’t know when my work and vacation schedules will allow me to volunteer again, but someday I hope to head back to camp. Volunteering at Camp Oasis was one of the most valuable things I have done. I would highly recommend it to anyone. Usually it is the big flashy things like climbing ropes, packs or tents that become my most coveted outdoor gear. Lately however, a much simpler and unassuming piece of gear has become one of my favorites. A couple of months ago UPTT Inc. sent me a One Pass Ostomy Draining Device (OPODD) to try on my adventures. Due to my hip injury, I had to put off testing the device outdoors until a three-day backpacking in Rocky Mountain National Park in June. This, however, did not stop me from trying it indoors. The OPODD is an instrument with two flat rollers that clamps onto your pouch when you want to empty. With one downward motion, the device pushes all pouch contents swiftly out of the tail. Though it took a few tries to get used to the OPODD, once I had the hang of it I found myself reaching for the tool again and again. It is especially useful on those days when my output is thick and difficult to push out of the pouch. One quick swipe of the device and the output is forced out — no matter what its consistency. I liked the device so much that I was soon using it every time I emptied at home. Though I usually leave the device at home because I seldom carry a purse, the slim design of the OPODD makes it easy to fit in a handbag or tote to be carried anywhere you go. The OPODD clamps on the pouch. Emptying the contents only takes one smooth downward swipe. 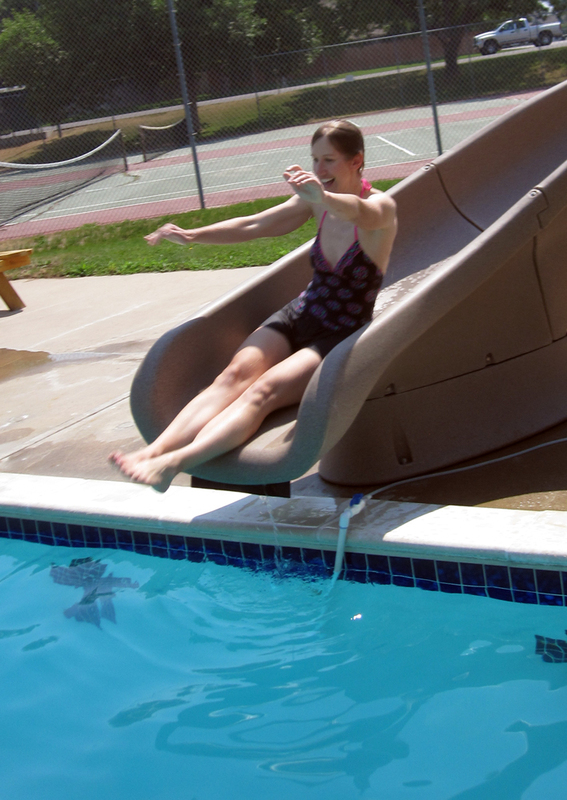 After trying it out, I was convinced that the OPODD was great to use at home. Now it was time to take it into the wilderness with me. Ever mindful of my pack weight, I am very picky about what I choose to bring on backpacking trips. Something has to be highly useful to make the cut. It didn’t take long to realize how happy I was to have the OPODD along on my first backpack adventure of the season. In the middle of cooking dinner on our first night, the sky darkened and big heavy raindrops spilled from the sky. We swiftly donned our rain gear and dashed under the trees with our dinner. 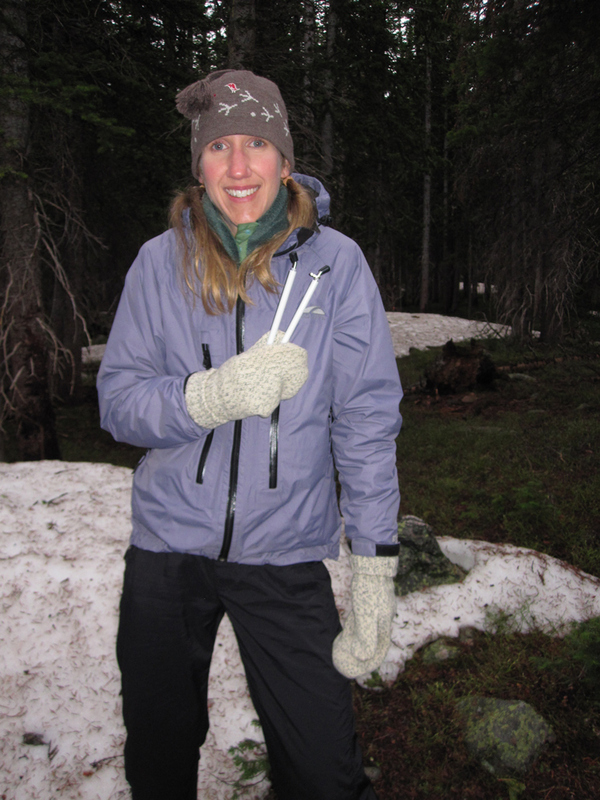 Despite being covered by tree branches and Gore Tex, my clothing soaked up the dampness and my teeth began to chatter from the chill. Leave it to my ostomy to decide that this was the best time to produce ample amounts of output. I had to make a trek to the camp privy in a full-on rain storm. 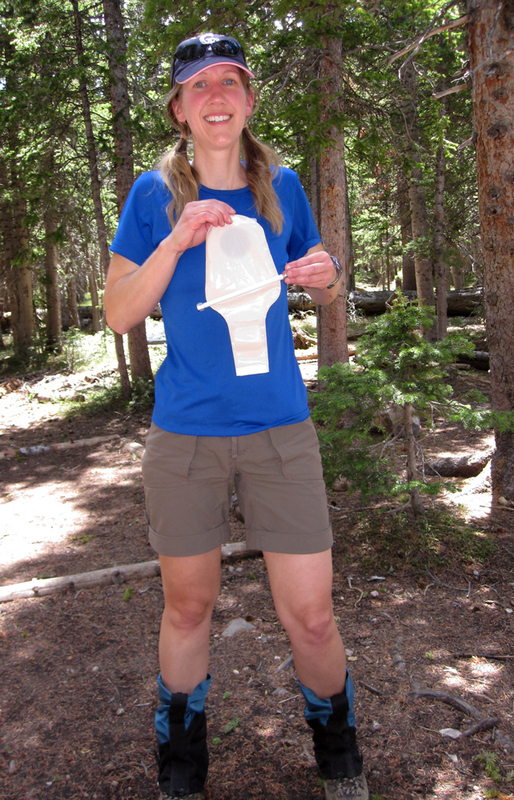 When I got to the backcountry restroom facilities (a pit toilet sitting out in the middle of the woods with no walls or roof), I quickly grabbed my OPODD, clamped it on my pouch, slid it down and had the contents emptied within seconds. Normally it would have been hard to manually work output to the tail-end of my pouch with such cold hands, but maneuvering the device was easy even with the chill-induced clumsiness. Heading to the privy with my OPODD on a very chilly evening. That night, the handiness of the OPODD proved itself again. When I do strenuous exercise such as backpacking during the day, my output often slows down or stops almost entirely. That means everything comes out later — often in the middle of the night. Getting up at 2 a.m and walking five minutes away from camp alone is unnerving. Sitting down to empty my appliance by headlamp while surrounded by miles and miles of pitch black wilderness spooks me out. It is one of those times when I swear twigs are being stepped on all around me, and I imagine mountain lions behind every boulder. Pulse racing and goosebumps fully engaged, I want to purge the contents of my pouch as fast as possible and get back to the tent. 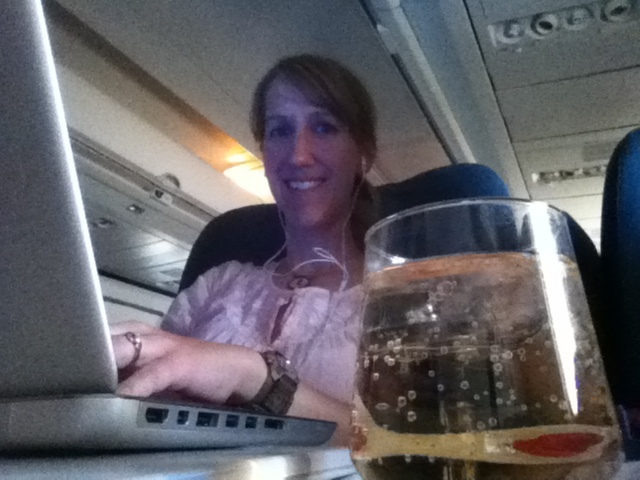 This particular night, I ended up having to endure this experience a couple of times. It was wonderful to be able to clamp the OPODD on my pouch, slide the contents out quickly and return to the comfort of my sleeping bag and the company of a snoring Doug. My positive experiences that first day made the device completely worth its weight — and that is really the only issue with bringing the OPODD on outdoor trips. For those who try to backpack on the ultra-light side, the OPODD weighs in at 3.6 ounces. Not heavy by any means, but when one is trying to get their pack weight as low as possible, every ounce counts. Personally I feel that the extra weight is a small price to pay for the ease the device adds to emptying my pouch in the wilderness. The only challenge I noticed with the OPODD was that it couldn’t slide over the Velcro at the end of my Convatec Pouches. This didn’t end up being an issue though. I would just push the output as far as the Velcro with the OPODD and then drain out the rest manually. This actually worked great because it prevents any output from getting on the device. 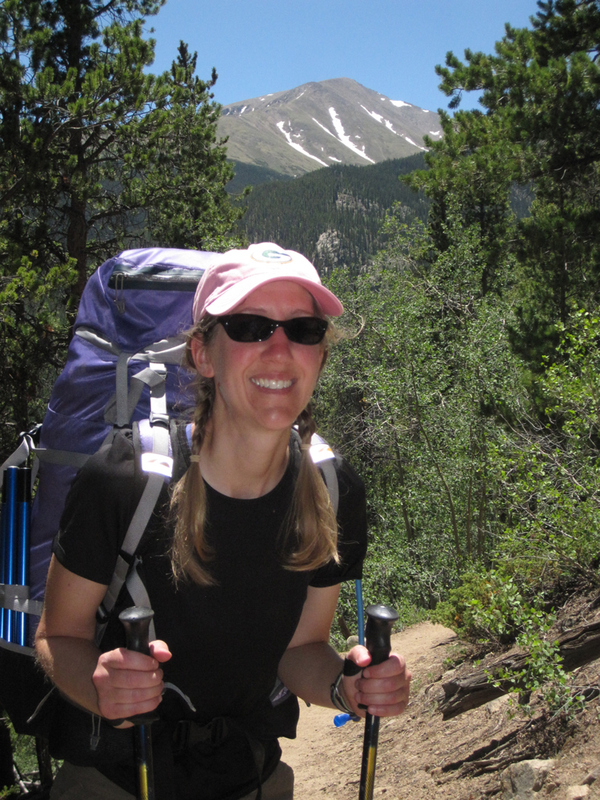 You can’t see my OPODD, but it is tucked in my pack as I head out on a backpacking trip in the Mt. Massive Wilderness two weeks after the one in Rocky Mountain National Park. I plan to bring the OPODD on every wilderness excursion in the future. As I continued to test out the OPODD, I realized that it was going to become an indispensable piece of outdoor gear. 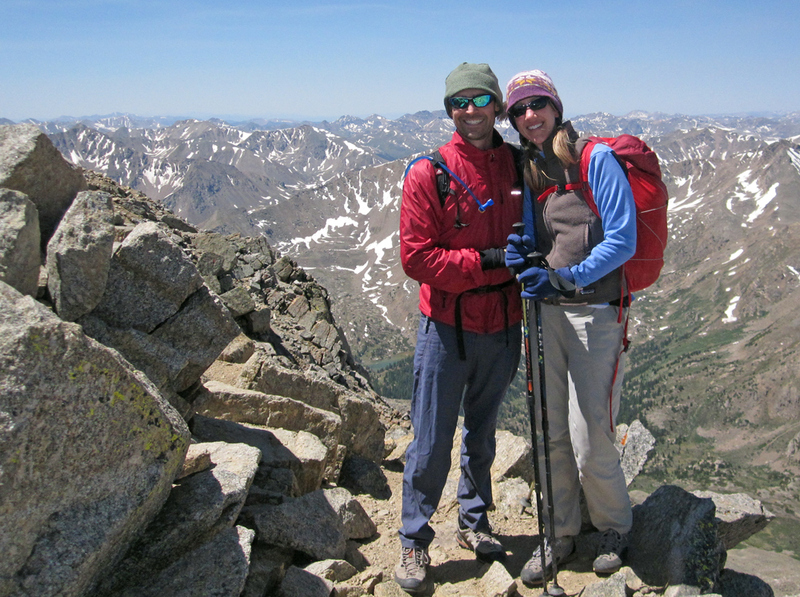 Two weeks after the Rocky Mountain National Park trip, Doug and I were out in the backcountry again on a hike up Mt. Massive which included two nights of camping in the wilderness. This time the challenge was mosquitoes which swarmed around me every time I tried to empty. One plus of having an ostomy is that you don’t have to expose your bum when emptying like you would when having a normal bm. Still, the skeeters were happy to attack the uncovered skin on my hands instead. The speed at which the OPODD allowed me to empty prevented me from getting many itchy bites. From cold hands, to scary dark nights and blood-thirsty insects, the OPODD came to the rescue and allowed me to empty quickly and easily. I never plan to hit the trail without it again.